It is amazing to live in a generation where technology is advancing because we get to witness life-changing events right before our eyes. Recently, there has been a substantial amount of conversation about three-dimensional printing and how it will change the future because we will be able to print objects instead of psychically manufacturing them. Lately, scientists have been experimenting on printing out anything they could think of, ranging from things such as adjustable wrenches to human organs. Yes that ‘s right, a human organ. You are probably wondering how that is possible. Well you are not alone because when I first heard about 3D printing, I thought to myself, “How in the world is that possible? I can’t even imagine that.” Then I heard about how 3-D printing had saved a baby’s life and I thought to myself, “Okay, now this is a joke.” Well, it’s not. At six weeks old, a baby boy named Kaiba had stopped breathing because of a rare obstruction in his lungs called bronchial malacia; this is a condition where the cartilage in the walls of the bronchial tubes are weakened. After being revived and taken home, Kaiba’s breathing had failed on him day after day causing his parents to constantly perform CPR on him. With the hopes of Kiaba’s survival diminishing, doctors didn’t know what else to do except perform a medical experimental technique equivalent of a “Hail Mary” pass, 3-D Printing. I can see 3-D printing becoming a process strategy within the mere future because it will be a production process that meets customer requirements and product specifications within a certain cost. In Kaiba’s case, it already has saved his life. Doctor’s had taken an x-ray of his lungs and transferred the picture to a 3-D printer to successfully duplicate a splint measuring “a few centimeters by eight millimeters.” Specifically, this would be considered a process focus strategy because creating one customized, artificial support to be surgically attached into a human requires the ability to be able to produce in low volume. Because of the low volume, doctors can then focus on producing a high variety of customized products for their customers. Having a high degree of product flexibility and a team of experts to meet your specifications and produce your product sounds like an excellent strategy for any ordinary individual; however, one thing some people might not realize are the costs associated with it all. Creating an object that saved Kiaba’s life is a phenomenal occurrence; however, the bill following the surgery is probably not. Do you think 3-D printing will one day become a Repetitive Focus strategy, or maybe even Product Focus Strategy? Is this a product that meets and exceeds customer requirements, costs and managerial goals? 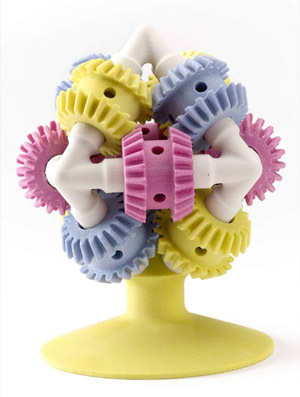 What do you think are the long term effects 3D printing has on efficiency, production flexibility and quality?